Now That’s a Grebe Shot! After seeing the Grebe "grab" shot we took at Harrier Meadow yesterday, Ron Shields e-mailed a Pied-billed Grebe shot he took at Mill Creek Marsh this summer. Writes Ron: "I was standing on the bridge at Mill Creek as the grebe flushed from the shoreline right in front of me and swam toward some of the exposed stumps." On the Mill Creek Marsh Walk yesterday, we got a tip from NJMC Naturalists Mike Newhouse and Gabrielle Bennett-Meany that there was an immature Little Blue Heron and a Pied-billed Grebe at Harrier Meadow. A few hard-core birders joined the BCAS's Don Torino and me for a look-see. All of us saw the Little Blue, and a few of us saw the Pied-billed Grebe, who was hangin' (floatin') with a dozen Common Mergs. I had been trying for more than a year to get a decent shot of the Pied-billed — this was as close as I have gotten so far. 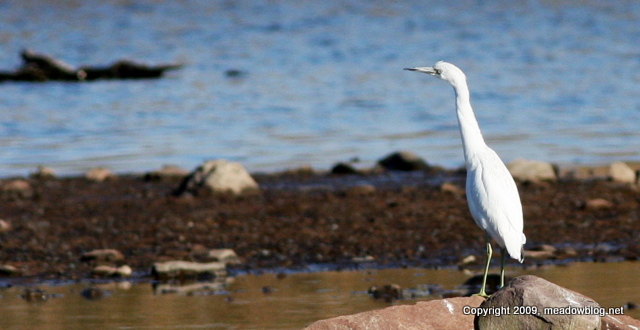 The little guy dived, and I never saw him surface… the Houdini Bird. More on Little Blue Herons here. 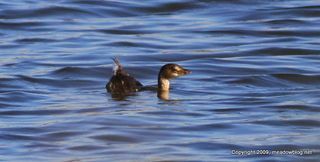 More on Pied-billed Grebes here.